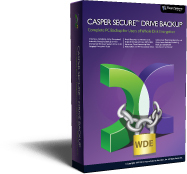 Creates a complete copy of an encrypted Windows system drive for backup or replacement1. Copies an entire hard disk or selected partitions and volumes. Resizes partitions during the cloning and imaging process to make full use of larger hard disks. Supports cloning and restoring images of larger hard disks to smaller hard disks. Runs entirely from within the Windows environment. Easy-to-use wizards for copying, imaging1, creating, and removing encrypted and unencrypted drives. Automatic Copy Verification™ ensures copies are not corrupted by defective RAM, cables, disks, or controller interfaces. Automatic Pre-image Verification ensures all data on source device is accessible before overwriting a bootable backup. AccuClone™ technology ensures a true copy with all encrypted data in its original encrypted state. SmartClone™ technology dramatically reduces the time required to maintain a backup. SmartWrite™ technology ensures maximum performance and full use of computer while performing a backup. SmartRestore™ technology provides easy, one-step support for restoring a system from a backup. SmartResume™ technology provides support for safely resuming an interrupted backup to another disk or image file backup1. Integrated scheduling allows backups to be scheduled daily, weekly, monthly, or at any time desired. SmartSense™ disk detection automatically detects when a new portable disk or an existing backup disk is attached to a computer. SmartSense automatic backup functionality fully automates the process of maintaining a system backup on a portable drive. SmartStart™ simplifies the process of backing up or replacing a Windows system disk. 1-Click Cloning™ permits routine backups to be performed at any time with a single click. SmartRelease™ automatically prepares a portable backup drive for safe release after the backup has been completed. Advanced Power Management support increases scheduling flexibility by waking computer to perform a backup and then automatically suspends, hibernates, or powers-off the computer completely unattended. SmartAlert™ Notifications notify you via email when a backup has been completed or only when a backup requires attention for true “set it and forget it” operation. Runtime controls allow you to quickly change power management and notification options after a backup is underway, regardless of how the backup was started. Automatic detection and support of solid state (SSD) and Advanced Format Drives for increased life span and enhanced performance. Automatically converts drives from FAT16 to FAT32 or from FAT to NTFS during the cloning or image restoration process when necessary. Supports all drives including SATA, eSATA, ATA/IDE, SCSI, USB, Firewire, and hardware RAID arrays. Fully supports all versions of FAT and NTFS. Supports GPT and MBR disk partitioning. Dynamic Volume support allows dynamic volumes to be copied to Basic Disks. Supports systems using either UEFI or BIOS firmware. Seamlessly copies dual boot Windows 8 and Windows 7 configurations, and other multiboot Windows configurations with Windows 8, Windows 7, Vista, XP, and 2000. Allows you to perform advanced disk management tasks, including create and remove encrypted and unencrypted partitions, change the active partition, change a drive letter assignment, replace damaged or missing boot records, and more. Compatible with all versions of Windows 10, Windows 8, Windows 7, Windows Vista, Windows XP, and Windows 20003,4. Native 64-bit support provides true 64-bit performance on Windows 64-bit platforms. Disk image file backups and related functionality supported only when running on Windows 7 and later. Booting from a USB connected hard disk requires a computer with BIOS or UEFI firmware support for booting from USB hard disk drive (USB-HDD) devices. Not all computers support booting and running from USB hard disk type devices. Some computers equipped with both USB 3.0 and USB 2.0 ports will support booting only when the device is connected to a USB 2.0 port. Windows Server not supported. Use Casper Secure Server Edition instead. Background copying is not supported on Windows 2000.